Vikings Corner: How can the Vikings leave Philadelphia with a win? How can the Vikings leave Philadelphia with a win? The Vikings will travel to Philadelphia with a Super Bowl berth on their minds. Daniel House discusses how Minnesota can scheme Philadelphia to pick up a win. Updated: January 19, 2018, 3:15 p.m. The script is just like everyone envisioned months ago. The quarterback Minnesota acquired from the Eagles in 2016 is injured during the first game. Sam Bradford is eventually placed on injured reserve and the reins are passed to quarterback Case Keenum. Keenum was a former teammate with Nick Foles, who replaced the injured Carson Wentz in Philadelphia. Now, they square off with a trip to the Super Bowl on the line. According to NFL Research, the NFC Championship on Sunday will mark the first time since 1970 that two quarterbacks will meet in the conference title game after neither passer started in week one of the season. The “Minneapolis Miracle” set the stage for an incredible opportunity, but the focus has shifted to developing a gameplan to attack the Eagles. A road game in a hostile environment won’t be easy, but Minnesota has the personnel to pick up a win during their biggest game in eight seasons. Quarterback Nick Foles’ passer rating under pressure this season is 23.8, per Pro Football Focus. The Vikings will run plenty of blitz packages and coverage disguises in an attempt to confuse Foles. Teams have been trying to get after Nick Foles all season. In order to be successful, Minnesota will need to get Foles on the run and out of a rhythm. The patented Double-A gap blitz will likely be on display. Minnesota hasn’t used it extensively, but it's been deployed in a timely manner this season. In last week’s game, Philadelphia got into a rhythm through quick-hitting run-pass option (RPO) looks. The key to stopping this is being disciplined in the backend and not allowing the quarterback to freeze the second and third levels of the defense. 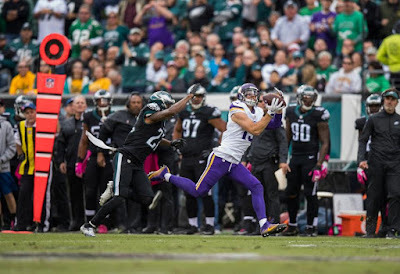 The Vikings need to tackle well and limit yards after the catch by players such as wide receiver Nelson Agholor and running back Corey Clement. They’ll also be tested by Zach Ertz, who is arguably the best tight end the Vikings have faced this year. I expect Minnesota to play plenty of man-to-man coverage with Xavier Rhodes handling Alshon Jeffery and Torrey Smith matching up with Trae Waynes. Safety Andrew Sendejo or Harrison Smith would be asked to handle Ertz. They’ll use this strategy, while sending plenty of pressure via stunts up front. If the Vikings can force Nick Foles into mistakes, they must take advantage. Creating a frustrating gameplan against a backup quarterback is something head coach Mike Zimmer has experience doing. He has created nightmares for low -to- mid-tier quarterbacks also season, including the likes of Andy Dalton and Joe Flacco. The Vikings will need to stop running back Jay Ajayi, who is one of the top running backs after contact. According to Sharp Football Stats, he has accumulated 3.35 yards after contact. The Vikings are a sound tackling team, but need to wrap him up immediately. If they can force the Eagles into third down situations, it would be ideal. Prior to Sunday’s game vs. Atlanta, the Eagles had converted just 23 percent of their third down attempts with Nick Foles under center. If the Vikings’ historic third down defense can get Foles into third-and-long situations, the matchup is very favorable. Minnesota didn’t use much Double-A gap blitzing action last week because of Drew Brees’ talented skill-set, but they certainly will deploy it against the Eagles this week. On offense, coordinator Pat Shurmur will do everything he can to get players in space. Quarterback Case Keenum can get into a quick rhythm by finding his targets on passes ranging from 7-10 yards. The Eagles often play off-coverage, which leaves so much flexibility for a Vikings wide receiver corps that can create yards after the catch. This strategy also matches up well with the Eagles’ very talented pass rush. Right tackle Rashod Hill will be tested by Brandon Graham and Chris Long. With Timmy Jernigan and Fletcher Cox inside, the Vikings’ interior will need to play well. When the Eagles get into nickel and dime packages, they will often place Brandon Graham inside, which has been a difficult matchup for past opponents. The offensive line needs to protect long enough for Keenum to find his options. Running the football will be difficult and Keenum will be asked to complete plenty of short passes to keep the chains moving. The Eagles have the top rushing defense in football and Fletcher Cox has been unstoppable during stages of the season. He is quietly one of the best interior defensive lineman in the game. More importantly, Case Keenum will need to read their defensive tendencies and get the ball out quick to take advantage. He completed 55.7 percent of his passes under pressure in 2017, which placed him in the top-five among active quarterbacks, according to Pro Football Focus. If the Vikings can effectively run short passing plays or run against an all-out blitz, it could create an explosive play. From a schematic standpoint, teams have attacked Philly with double moves all year. That’s good news for the Vikings as their roster features three receivers with excellent double move skills (Thielen, Diggs and Wright). Wright might be a quiet x-factor as he is one of the best underneath receivers the Vikings have on their roster. The Philadelphia cornerbacks try to jump routes often, especially shallow concepts. It has burned them all season when teams have run double moves. Defensive coordinator Jim Schwartz loves to send pressure, which makes cornerbacks think they have more freedom to jump routes. As you can see below, the Eagles have been susceptible to these plays all year long. As a whole, Keenum needs time to throw and can’t make mistakes. The Minnesota defense allowed New Orleans to creep back into the game through Keenum’s poor deep interception. Opening the game with quick passing prevents Keenum’s from throwing downfield too much and attacks the Eagles’ scheme the best. Minnesota can also run plenty of screens later in the game when Philadelphia sends extensive pressure. The Vikings match up well with the Eagles, but must control the line of scrimmage and limit mistakes on offense. If they can do this, the Minnesota defense will create enough pressure to force quarterback Nick Foles into mistakes. If he indeed forces things, the Vikings need to take advantage of a short field and score points. The first team to reach 20 points will likely win this game as two solid defenses clash. Minnesota must start strong and claim a lead as they attempt to punch a ticket to their first Super Bowl in 41 years. If the Vikings win, they’ll host the biggest sporting event at home, which is a dream come true for Minnesota fans across the state. It won’t be easy, but the Minneapolis Miracle wasn’t either, right?